Do Personal Injury Lawyers Also Handle Property Damage Claims? The truth is that not all people who are involved in a car accident need an attorney to represent them. In fact, it is sometimes not financially justifiable for certain car accident victims to hire a personal injury attorney to handle their case, especially if injuries are very minor or non-existent. If you do suffer serious injuries in an accident, however, you will then be faced with essentially two separate components of your claim; the personal injury aspect and the property damage aspect. Let's break down the differences between the two and explain when each piece warrants hiring an attorney. 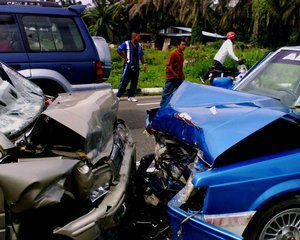 Let’s say someone is involved in an accident and suffers significant injuries in the collision. In addition to a couple of broken bones and some soft tissue damage, the person’s car is totaled and they will have to rent a car for a few weeks. 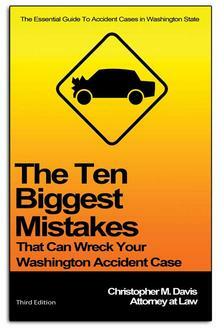 If the injured person has read attorney Chris Davis’ book, The Ten Biggest Mistakes That Can Wreck Your Washington Accident Case, then they know that the first mistake that people often make is not promptly receiving medical treatment for their injuries. Because of this, they went to the hospital immediately and were treated for the broken bones and other injuries. Medical treatment costs money, so the injured victim would benefit from holding onto the medical records in order to keep track of the financial loss they suffered as a result of the initial car accident. In a personal injury case, these would be attributed to economic damages suffered, because the victim paid for medical treatment that was only necessary because of the accident. Because there is an exact price tag associated with the medical records, it is hard to dispute the amount of compensation that is owed to the victim for treatment. The part that gets tricky is the long-term care, because this requires estimation of the victim’s recovery process and the amount of money that future rehabilitation will cost. That will be factored into the damages being sought in a personal injury claim. Much like the financial losses associated with an injury victim’s medical treatment, the losses associated with property damage are pretty straightforward. If the victim’s car was worth $10,000 before the accident occurred, then it is hard to dispute that the person should be reimbursed for the full value of their vehicle. However, since the insurance industry is known for its unethical business practices in order to make as much profit as possible, there are a few complications when it comes to property damage. First, your adjuster will likely make you a series of low-ball offers after you make a claim. They may also be unpleasant with you and pressure you into accepting their offer, even if it's not enough to cover your vehicle. Obviously, it would be unwise to accept an offer for less than the amount that you deserve for your totaled vehicle. Research the value of your car and tell your adjuster that you know the true value of your vehicle. Because there is no negotiation over the cost of replacing your vehicle, it is usually unnecessary to hire an attorney for property damage claims. In a best-case scenario, you are only going to be compensated for the full value of your vehicle. And since a lawyer’s fees are typically one-third of the settlement, it would be counterproductive for an attorney to handle a property damage claim because you would end up with less than the full value of your vehicle. This is why Davis Law Group almost always recommend that people handle property damage claims on their own. That’s not to say that another attorney won’t handle your property damage claim, but chances are that you will end up with less than the value of your car. As always, consulting with a qualified personal injury attorney is the best way to determine your legal options after an accident.